What are the most common causes of injuries to children on farms? What are the most common causes of death to children on farms? Machines including tractors, motor vehicles and all terrain vehicles (ATV): A young child who is a bystander can be run over by a machine on a farm. A young child who is riding as a passenger can fall off and be run over. An older child can be involved in an ATV rollover. Drowning in ponds, manure pits, wells and cisterns. According to a research published in the Injury Prevention Journal * in 2005, the following five priorities have been identified to help prevent non-work related injuries on farms involving children. Prohibit access to the farm worksite. 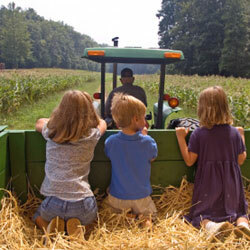 Young children should not accompany adults while they are working on the farm. Provide constant adult supervision to your child. Install passive physical barriers. Install fences around hayloft, around water hazards and animal enclosures and vehicles compounds. Institute safe storage practices. Safely store large worksite objects and tools out of reach of children. Develop guidelines for common recreational activities, including horseback riding and use of an ATV. According to the Canadian Pediatric Society , nearly 25% of ATV related deaths occur in Canadian children under 15 years of age. *Pickett W, Brison RJ, Berg RL, Zentner J, Linneman J, Marlenga B. Pediatric farm injuries involving non-working children injured by a farm work hazard: five priorities for primary prevention, Injury Prevention; 2005; 11:6-11. Reviewed by Trauma specialists at the Montreal Children’s Hospital.